The joys of knobs. And patch points. And empty bank accounts. While this may be old news to my followers on Soundcloud, Twitter and Instagram, I’ve configured my first Eurorack-format modular synthesizer. These cabled amalgamations of faceplates, cables, circuits, and glowing LEDs are desirable, fetishized, addictive, and steeped in history. But, really, they’re just tools. But what tools they are. Modular synthesizers are no longer relegated to the dustbin of history, nor an underground elite (as well documented in the excellent documentary, I Dream of Wires). They have come roaring back, arguably leading the way in technical synthesis innovation, and are a commonplace instrument in many studios. This boom has even gotten the heavyweights of mass market synthesizers, like Roland, to (re)release Eurorack modules, and pop musicians like Martin Gore to release all-modular electronic albums. It’s tempting to just buy flavor-of-the-month new products, but that way lies financial ruin and a studio full of stuff you don’t use. The way to stem the financial bleed and random module selection is to place limitations on the process. For me, the limitations were as follows. I’ve got a significant investment in existing software and hardware that I want to honor and leverage, not duplicate. I’m designing an additional instrument, not building a new studio. I have limited physical space in my home studio. Therefore my case will be on the small side, and that will enforce limits on the number of modules I can purchase. I will “version” the modular synth and roadmap it, as if I was designing an actual instrument or a piece of software. 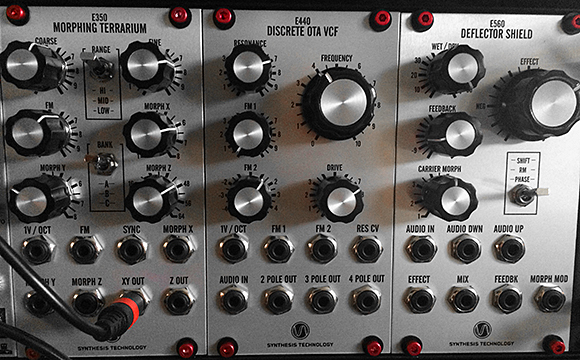 I will buy modules in two initial rounds: v0.5 to instantiate the most basic system to ensure that the workflow and gestalt of modular synthesis does actually speak to me, and then a v1.0 that I will live with for a year. Only after user testing – my own, of course – can I roadmap a meaningful path to a v1.5, v2.0, and so on. My current system lacked in two key areas: complex modulation options and the ability to support serendipity. My existing tools didn’t have much in the way for allowing for happy accidents, randomness, and cross-modulated signals and patterns of control. When my most interesting and complex synthesized rhythms and timbres I was creating were coming from Propellerhead Reason during my morning bus commute, I knew something was missing in my main studio. Software is an expense, hardware is an investment. Software suffers from instability and, over the long haul, the danger of becoming incompatible that many hardware units do not. I’ve already been enjoying workflow of using external hardware as sound sources and then post-processing them digitally, or the other way around. With the above considerations, the idea of a flexible, modulation-rich instrument to add to the stable seemed to make sense. 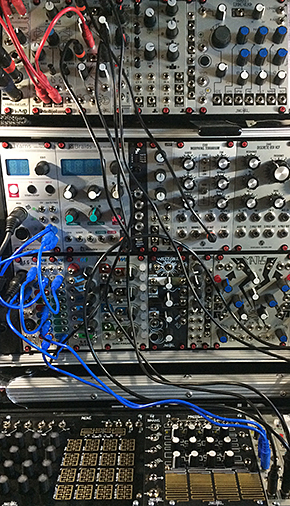 Modular synths are, well, modular: Flexibility is what they’re all about. But you are building your own instrument. Without a sense for what you want to accomplish, you’ll overspend and not get what you really need…and, more dangerously, you won’t know when you should stop buying modules. Most of us don’t have the disposable income to buy modules willy-nilly. Here were my rules of engagement for assembling my modular synth. These will change over time, but it helped me understand what the first iteration of this instrument would be. I wrote these down and re-read them any time I started to think about adding a new module. No analog oscillators. While that may seem against conventional modular wisdom, I have a total of ten analog oscillators across four other devices. I’ve got this covered. Go for something really unusual as a sound source. No effects. I know that even if I monitor a track with effects on, I always record dry and have effects as plugins or rendered to separate tracks. I use tons of plugins and stompboxes: I have effects covered already. Go nuts with modulation. Having enough tools to generate and modify clock signals and control voltages will be critical, because I don’t have digital tools that excel at this. Get more modules that control modulation than produce sound (or, ideally, ones that can do both). Don’t forget the DAW. I’ve got a significant investment in a computer-based audio workstation that should be leveraged, so ensuring that modulation and clock signals can drive the modular was critical. Embrace multi-tracking. Look at the modular as a sound design station, instrument, or voice, not as a complete studio. Get enough expressive options to do drones, melodies, and unusual percussion…but I don’t have to do all these things at once. That also means no more than 2 channels in or out of the modular synth. You can read all the key specs on my modular synth, its output and effects subrack (told you I’d break some rules! ), and its “controller skiff” on ModularGrid.net, so I won’t geek out about it here. So far, though, so good. There’s nothing mysterious about putting a modular together or how it’s used, as long as you have a good grasp of signal flow inside a typical synthesizer. It doesn’t really take any other technical skills other than using a screwdriver, reading directions, and doing simple math around power consumption. I’ve got solid sync with my DAW. I’ve got an instrument that can do things none of my other instruments can, and vice-versa. I’ve got methods to interface with effects pedals, external semi-modular instruments (even with different interconnects), my DAW, and even my iPad. It’s deeply integrated into the rest of my studio. It’s small. Full, but small. It’s even able to be self-contained if I decide to embrace limitations and create sounds or music only with this instrument outside of my studio or otherwise away from my DAW, even with my vintage Roland TR-606 drum machine. It’s capable of percussion, melody, and drones that can modulate in complex and random ways over seconds or many minutes. Modular users have a reputation for noodling and sound designing, but never actually completing songs or projects. It’s like an aural sandbox. The satisfaction of signal routing is autotellic: It’s its own reward, constant discovery and following or rejecting conventional wisdom. It’s also extremely meditative once you’re past the initial learning curve. I’ve already broken the “no effects” rule, but only with modules that can be “self-patched” and act as sound sources in their own right. Even having only purchased digital oscillator modules, analog modulators like LFO’s can often be used as analog oscillators when they are pushed into the audible range, as can filters that self-oscillate when their resonance is set high. I even wound up with four analog oscillators without knowing it. Once you realize that anything can be routed into anything, all synthesis rules go out the window. LFOs and filters can be oscillators, as mentioned above, but clocks can be triggers, envelopes can be clocks, envelopes can be LFOs, audio amplitude can modulate anything…that’s the mind implosion and creativity that modular synthesis brings. 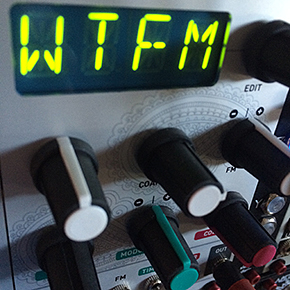 Over time, will I jettison older gear and go all Eurorack? Will I dispense with the computer entirely for making music? Probably not. But I’m sure my system will slowly expand, change, and evolve with my interests, just as I’ve shifted from oils to acrylics to pastels to pencils to pixels in my visual arts career. The initial rules I started with will morph, change, get relaxed, and get updated. My initial configurations has gaps and weaknesses, but nothing’s perfect. And now I’m good to go with a new palette of sonic colors. Now, if you’ll excuse me, I have field recordings to run through my modular. Great article – both instructive and cautionary. I’m curious what you’re using for your main clock – are you getting that “in” over MIDI from your DAW? Bob, that’s where it gets interesting: The clock in my system can come from a few places! My Roland TR-606 drum machine can send its DIN Sync signal in, controlling the modular. My DAW or iPad can send in MIDI clock. I can set up a looping envelope and that drives the modular with a pulse at the end of each cycle. I can use one of my LFO’s as a tap tempo and route that as clock. My Grendel Drone Commander can output a clock that can drive the modular. And that’s not just me making a list: I do all of these things different on almost every track, depending on what anchors the piece or starts the inspiration flowing. Very cool! AFAIK Maths also throws a clock too. I’m looking hard at the 4ms SCM and RCD and their respective breakouts. Clock management is the heart of the argument IMO. Bob, yeah, Maths can fire off pulses at the end of rise or end of cycle on an envelope. I prefer (usually, not a rule) to not tie up something as valuable as a channel that can do slew, cycling, or envelopes to just generate timing pulses. But yeah, I’ve definitely used Maths to drive clock from time to time. Good for when you’re patching fast and inspired.